What Can College Athletics Communications Pros Learn From The Olympics? Caveat: I worked for two Olympic Organizing Committees – Atlanta and Salt Lake City – in media operations. In each instance we contracted with many excellent sports information directors to execute our games time operations. I am pleased to say that I have worked alongside several CoSIDA Hall of Fame members. This is by no means a critique on their work. The Olympics and college sports are different. But they don’t have to be. From a broadcast presentation and media relations standpoint, colleges could learn from the Olympics. Contrast the final play of this year’s College Football Playoff with anything you see in the Olympics. Seriously, click the link and watch the play. Pause it. Rewind it. Watch Irv Smith, Jr. (#82 on Alabama) truck a member of the media as he attempts to celebrate with his teammate Devonta Smith literally seconds after the game-winning touchdown. Why is it necessary for media to be in the faces of athletes immediately after a play? I get rightsholders pay for access and I am fine with that. But the guy knocked down in the end zone wasn’t a rightsholder. He was a photographer on the field, undoubtedly seeking to get as close to Nick Saban as possible. Mere seconds after the national championship ended, he was running to get make a photo like an injury lawyer chasing an ambulance. There is no rushing of the field of play in the Olympics. In fact, at the Olympics, the “field of play” area – whether a court, a field or an ice sheet – is sacred ground. Only athletes, trainers, sport personnel, coaches and the host broadcaster are allowed on it. Despite this restricted access at the Olympics, the media are able to tell compelling narratives and make wonderful, emotional pictures without ever setting a foot on the field of play. Who can forget the Sports Illustrated cover after the 1980 U.S. Olympic hockey team beat the Soviet Union? It was voted the most iconic cover in the magazine’s storied history a few years ago. Photographer Heinz Kluetmeier discussed that photo with Deadspin this past August, recalling he made the photo from his position in the stands which provided “the best location” to get the crowd. 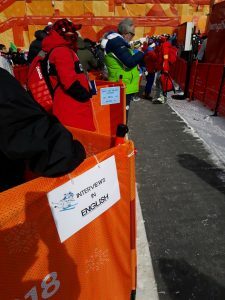 Another fundamental difference in operations between the Olympic Games and most professional and college sports is the presence of what is known as the “mixed zone,” so named because it allows athletes and media to “mix” after the athlete has finished his or her competition. Make no mistake, the mixed zone can become an ugly, unruly place, as media clamor around to listen to the disappointment of an athlete who finished out of medal contention. Physically, these mixed zones are often in the bowels of an arena and segregate the media on one side of a bicycle barricade and the athletes and coaches on the other side (see picture). In Salt Lake, we started placing athletes on small wooden platforms so their voices would project further, and placed them inside of a “V” to allow more media to be able to hear the athlete. The mixed zones in PyeongChang have added wireless mics and speakers. Every athlete is required to pass through this space. Though no one is required to talk to the media, most do. This is a fundamental difference between college media relations and the Olympics. Whereas SIDs often choose a select group of athletes to make available to the media, everyone is available in the Olympics. The top three place finishers in each event go to a formal press conference. Two-to-three members of an ice hockey team may go to the press conference, while everyone else passes through the mixed zone. If a reporter is covering an athlete from his or her hometown or country and that athlete finishes eighth, this is the reporter’s opportunity to interview the athlete as he or she will not be going to a formal press conference. Professional sports use open locker room access to accomplish this same objective. Both the Olympic Games and college sports were founded on principles of amateurism even if the organizations have not always shared similar definitions of that ideal. Jim Thorpe was stripped of his 1912 decathlon gold medal because he was found to have played semi-pro baseball in North Carolina, half a world away from Stockholm, Sweden where he won his medal. On the other hand, Chris Weinke won a Heisman Trophy after playing minor league baseball, but I digress. Obviously, amateurism in the Olympics is no longer the case. Professional athletes from all sports regularly appear in the Games, and Olympic athletes are free to earn as much as they can in endorsement dollars, so long as they don’t tweet about it during the Games. College athletes, on the other hand, cannot earn any money in endorsements. They can, however, sit in front of interview backdrops advertising insurance companies and other commercial products. They can also wear the logo of bowl game corporate sponsors, such as Belk and Chick-fil-A, on their uniform. Yet, curiously, the IOC does not permit that. Olympic backdrops reflect the “look of the Games” and do not contain any sponsor logos, save for the Coca-Cola beverage on the interview table. Skiers are well-coached to show off their sponsors while waiting to watch other skiers finish their runs in a sort of rebellious way. Outside of perhaps the Masters golf tournament, the Olympic Games run the cleanest venue in sports with little commercial intrusion into the field of play or telecasts. In a world in which the costs to stage an Olympic Games are rising astronomically and a dearth of cities interested in hosting the Games exists, it is surprising the IOC does not attempt to sell every possible inch of the venue to corporate partners. A four-year Olympic sponsorship runs around $100 million before activation and advertising. With the prevalence of online streams and DVRs changing the viewing habits of Olympic viewers, it would be natural for sponsors to want more in-venue placement which can be memorialized in broadcast coverage and still photos. Yet the Olympics, thus far, have held firm in the face of those commercial temptations, eschewing potential additional marketing dollars for a clean looking product, one which focuses attention on the athlete and his or her performance. Even buildings with naming rights get different monikers for the Olympic Games. Figure skating, for example, was contested in the Salt Lake Ice Center in 2002 since the building was known as the Delta Center at the time of the Games. It is highly unlikely that college sports would consider reversing its current financial model to eliminate corporate logos and commercial crossover. But, it could move toward focusing game presentation and operations more on the athletes than commercial interests. A first step would be to tighten access for individuals around the field of play. Do boosters really have a function on the sideline? Do photographers need to sprint on to the field at the end of the game like a horse released from the starting gate at the Kentucky Derby? In most cases, schools are fined by their respective conference if fans storm the field or court after a game, but this does not include the dozens of boosters already on the field because the athletic department hopes the access will lead to a larger gift. College sports could also eliminate corporate logos on interview backdrops though this may happen naturally. Just two weeks ago, Auto-Owners Insurance tired of its logo being visible during negative Michigan State press conferences about the Larry Nasser scandal and requested its logo be removed. Potential sponsors, and athletic departments, need to question whether the benefits of association during positive times are worth the risk if something negative breaks out. Finally, the notion that all athletes should be available to the media on their way off the field or court is a utopian idea at best. When all members of the media hear the same post-game quotes from the same sources, stories become homogeneous. SIDs should encourage greater diversity of voices. Make more, if not all, student-athletes available. Like the Olympics, media may still gravitate toward a select few, but the stigma that universities are limiting access, or saving athletes to create and promote their own “exclusive” content, might subside. Doing so may improve the working relationship between universities and the media.